After a couple of days in Kuala Lumpur, it was time to find a beach! 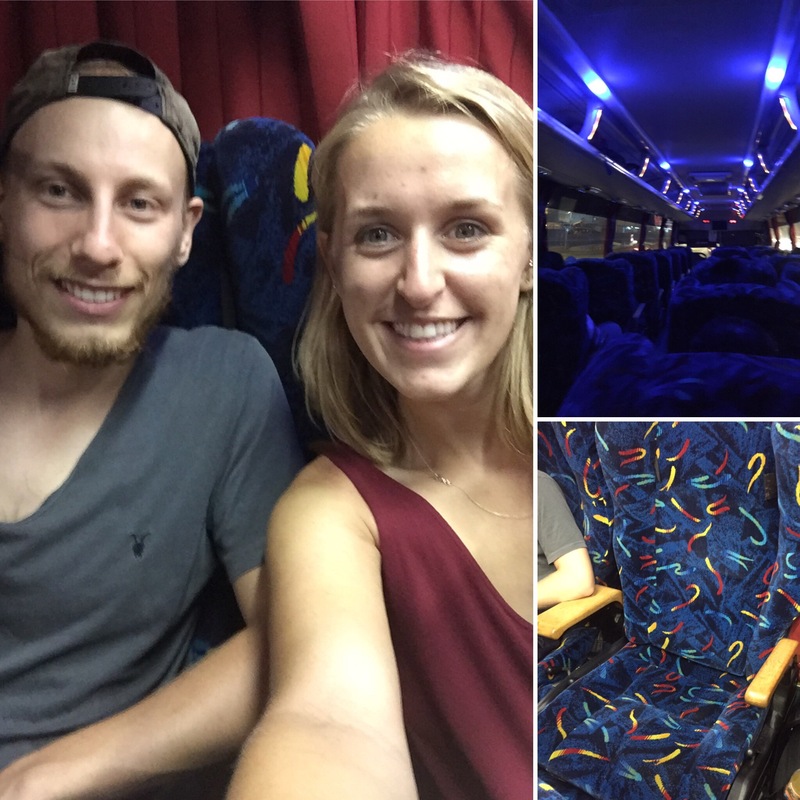 On the 17th October 2017, we got a night bus to take us to Kuala Perlis in the north of Malaysia where we would then get a ferry to Langkawi Island. The bus was surprisingly comfy with big, soft seats that reclined quite far back, good air-conditioning and USB ports. We arrived into Kuala Perlis at 5am on the 18th October and got the first ferry over to the island at 7am. After our lack of sleep and need for a rest we decided to head to Tanjung Rhu Beach which was on the north of the island. This was a lovely, quiet beach with shallow, warm water looking out over small, tree covered islands in the sea. 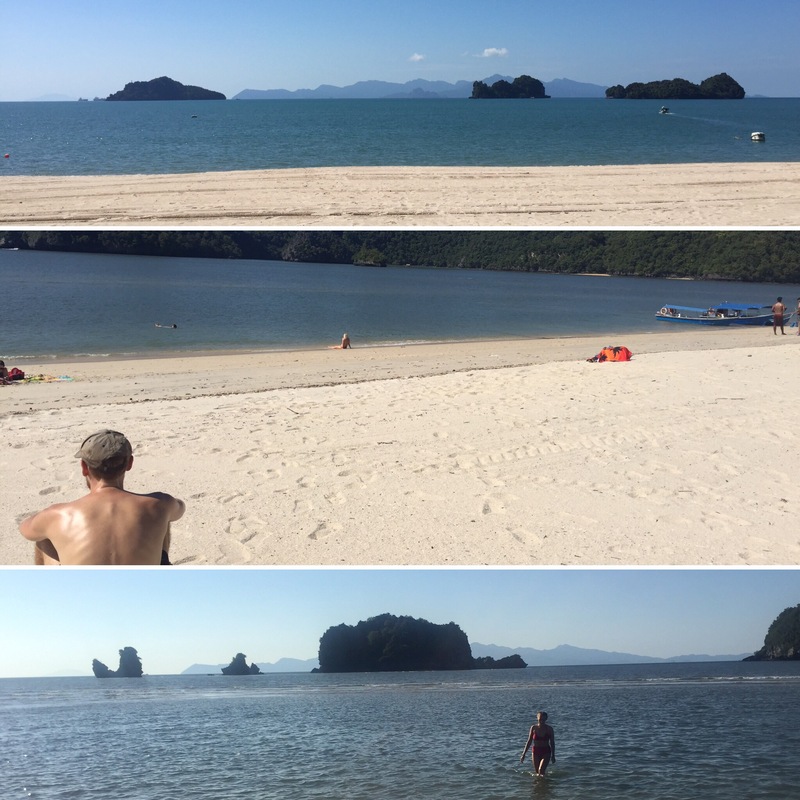 It was a piece of paradise and was our first Asian beach – I have to say, it wasn’t a bad one to start with! We spent our time sunbathing and relaxing in the sea. I walked out to sea for at least 20 metres before I stopped as the water started to get a bit more cloudy making it harder to know how deep it might suddenly go and I hadn’t even gone up to my waist! The beach was so peaceful and it was great having hardly anyone else around. 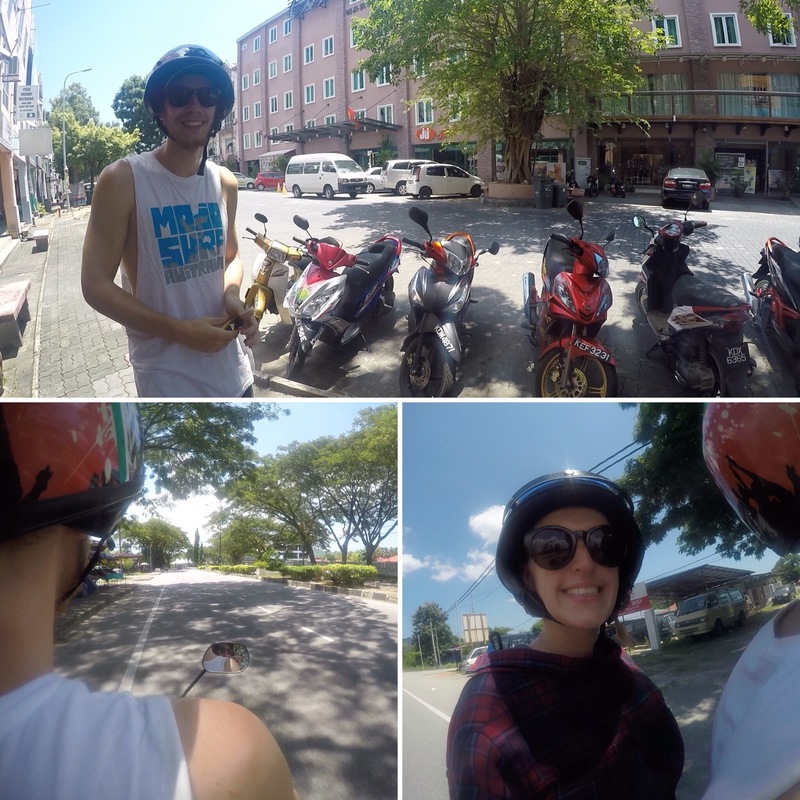 We drove back to our hostel being able to take in the sites a bit more now that we were more used to riding the bike. As mentioned in my Australia posts, it would be strange not seeing kangaroos anymore at the side of the road, well luckily we now had the excitement of monkeys being everywhere we looked! Whilst you’re driving along you’ll randomly have to slow down as a group of monkeys will be sitting, minding their own business in the middle of the road! It was really cool to see them and it’s something I imagine we’ll see a lot more of during our time travelling around Asia. That night, we were lucky enough to be near to a food market that moves around the island to a different location each night. 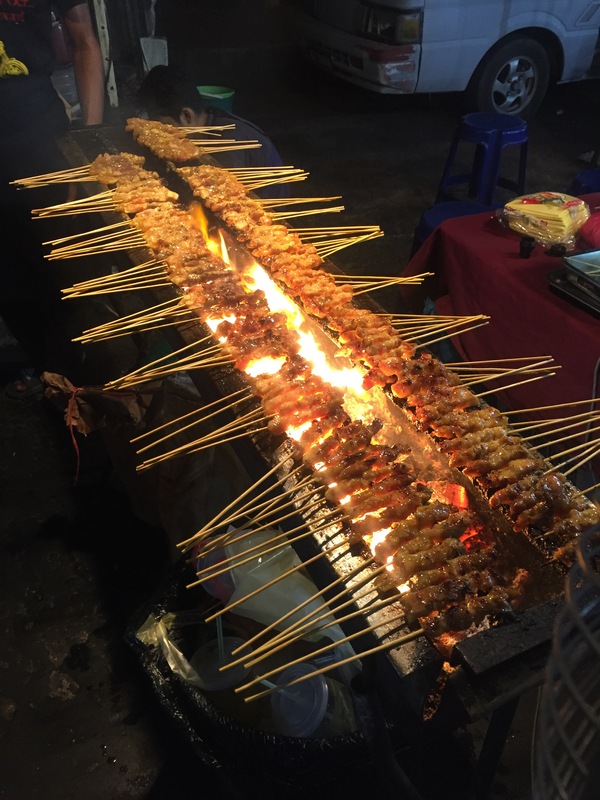 It was a really good, cheap market and we had a range of food while we were there including Satay (barbecued meat) which is a huge thing in Singapore and Malaysia. . Probably our favourite stall though was a juice place that did big cups of Milo (a popular brand of chocolate milk on this side of the world) for only 1 Ringgit (18p). It’s funny how it’s the little things like that which can be so appreciated whilst you’re travelling! 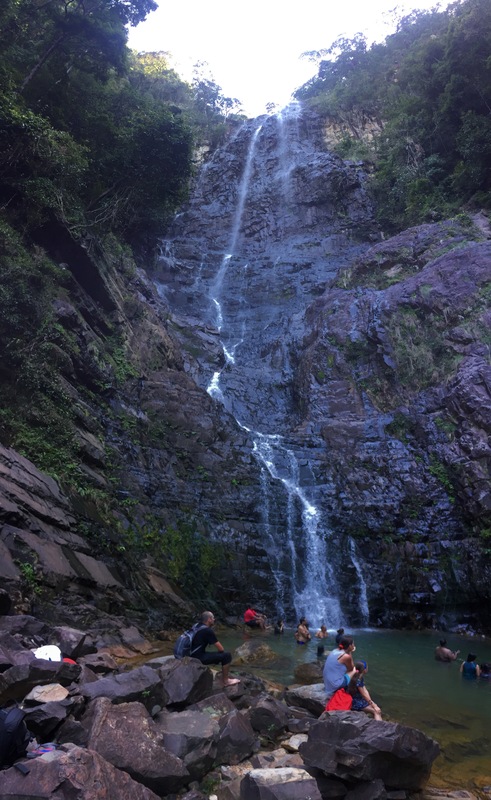 The next day (Thursday 19th October) we drove to the Seven Wells Waterfall which is on the north west of the island. You had to climb 638 steps to the top of the falls which began with a number of small natural paddling pools that moved down the mountain before dropping over the side to form the main waterfall. The views from here, as well as seeing the start of the falls, made the walk worth it and it certainly didn’t feel like we had walked that many steps. 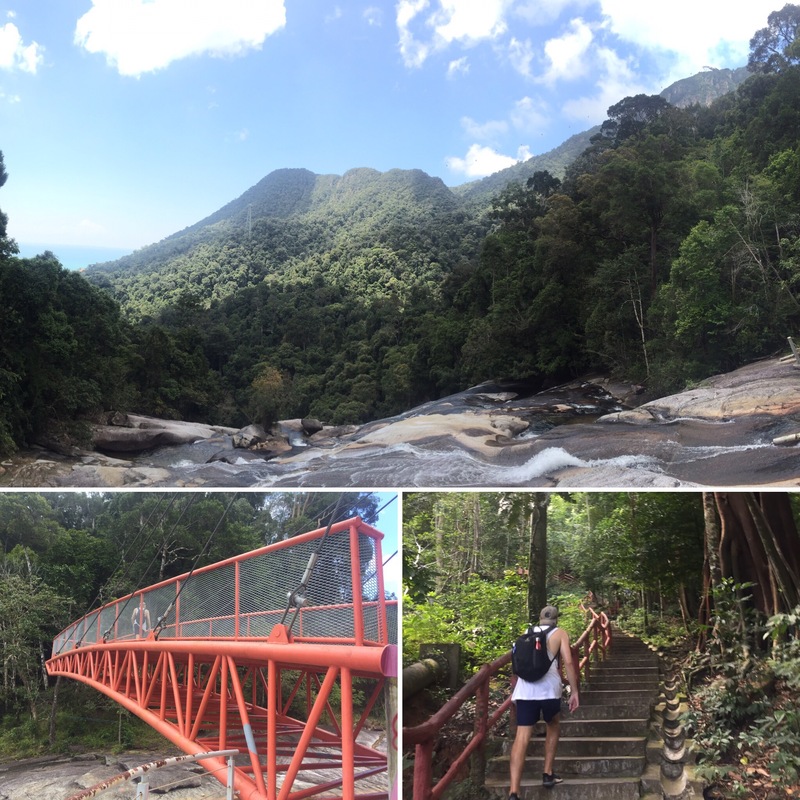 We chose to see the falls from the top and then take detours to viewing points as we continued down. It was a really hot and humid day so we cooled off in the natural pool at the bottom of the falls after the climb. 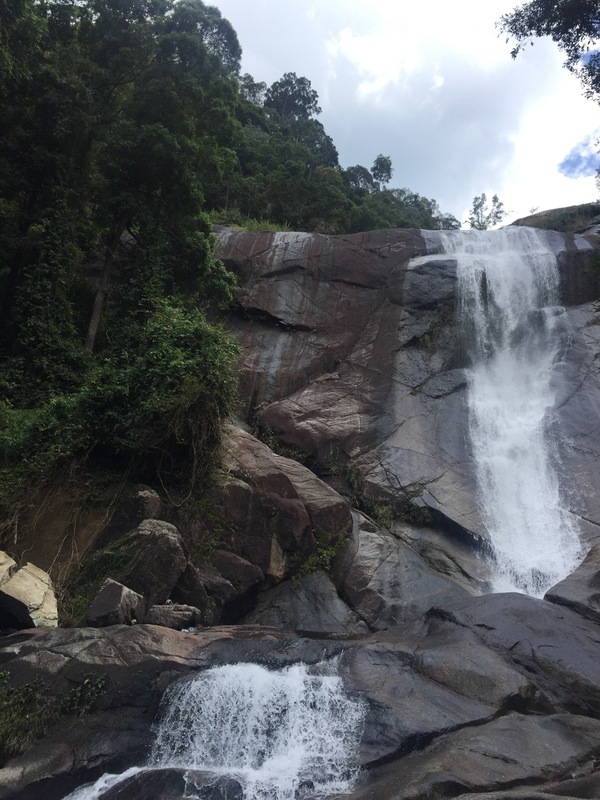 Our next stop was to Temurun Waterfall. I think I prefer this falls to Seven Wells as you walk through a jungle path into a clearing where the tall, thin waterfall stands, crashing on the rock face of the canyon. 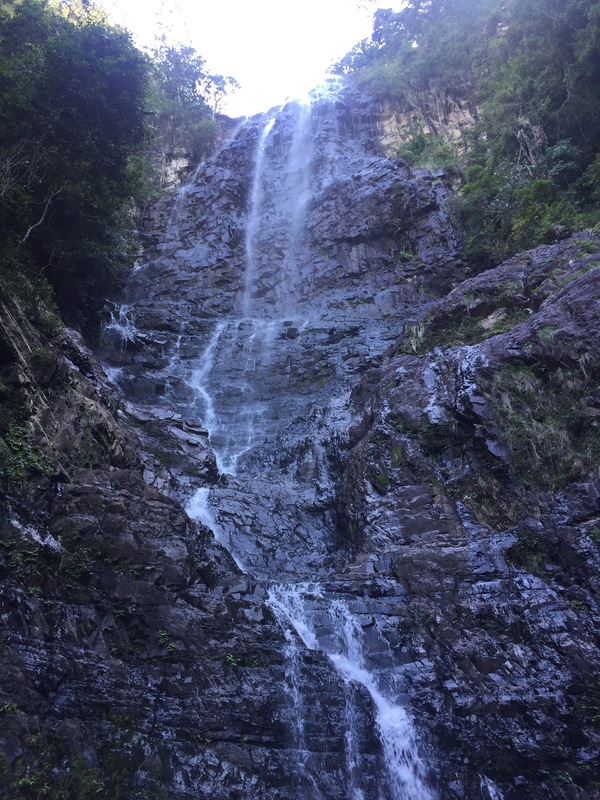 This waterfall was a lot busier as it is a popular picnic spot for locals – I think it was mainly one party when we were there though so I guess it could have easily been empty on another day which would have been even better! 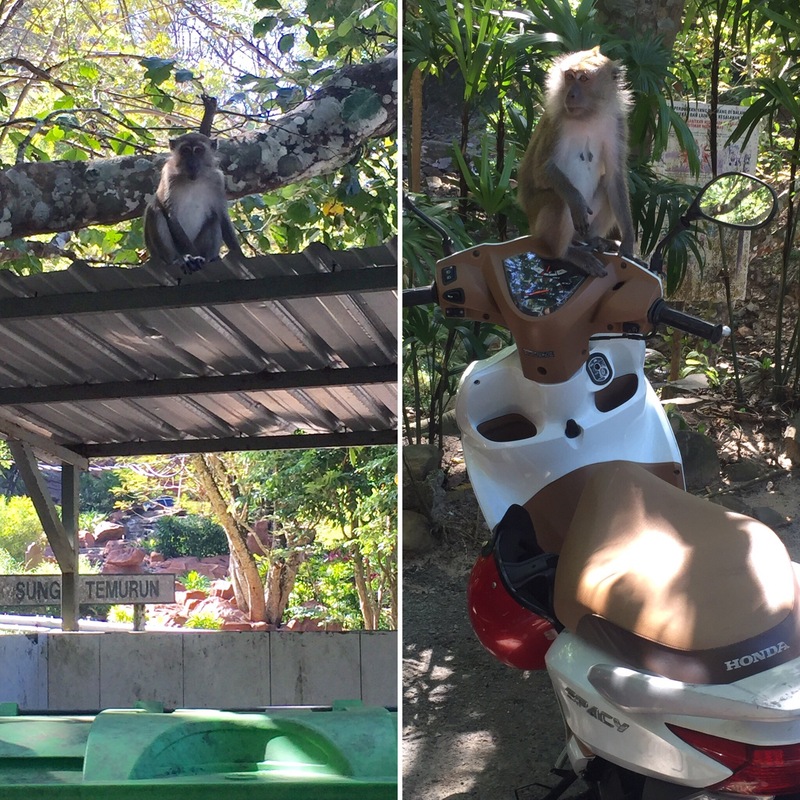 There are also loads of monkeys at this falls and you have to watch out when drinking or eating here as they’re ready to try and steal it! 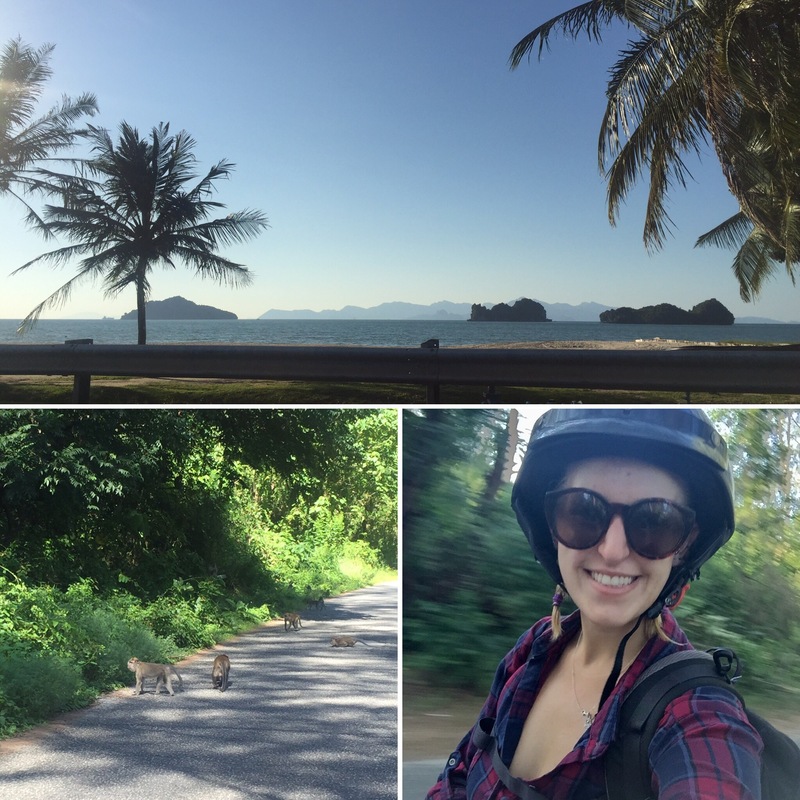 We drank some water before getting on our bike and a monkey started getting closer and closer to us to try and take it (a local warned us and we drove away). You can’t really blame the monkeys though, particularly if the spot often has a lot of picnic goers then they’re not going to turn down an easy way of getting their tea! Our last stop for the day was to Gunung Raya which is the highest mountain on Langkawi Island. We didn’t go to the very top of the mountain as we got good views around a third of the way up and it was getting late in the day. The views were great looking over rice terraces, farms, jungle and out to sea. 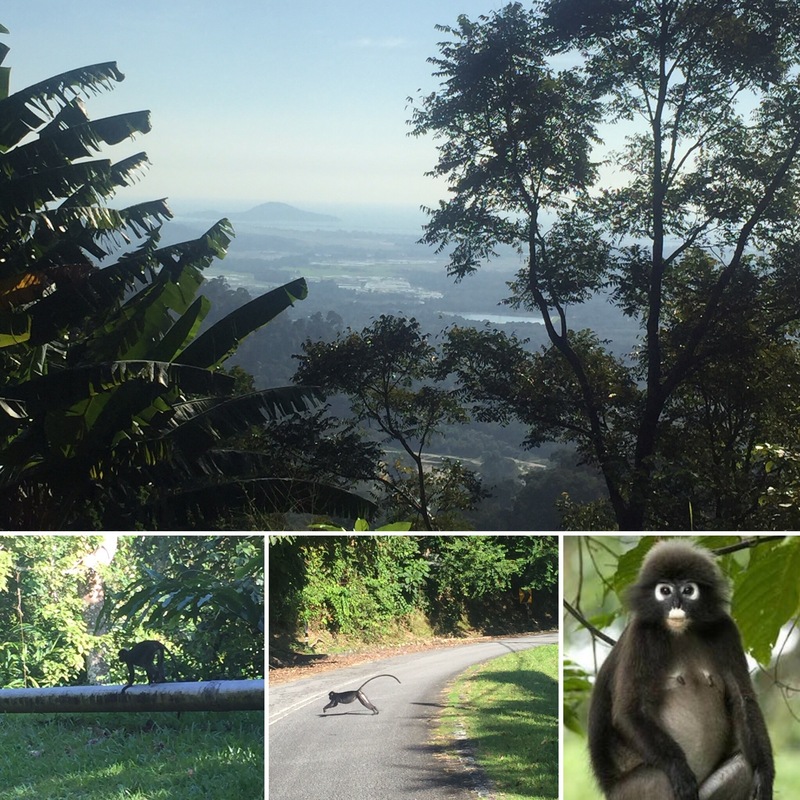 Another highlight from this drive was that we saw the Dusky Leaf Monkey which are black, fluffy monkeys with long tails which are not as common to see throughout the island. The last picture is from google to show you what they looked like as I couldn’t take a picture fast enough! 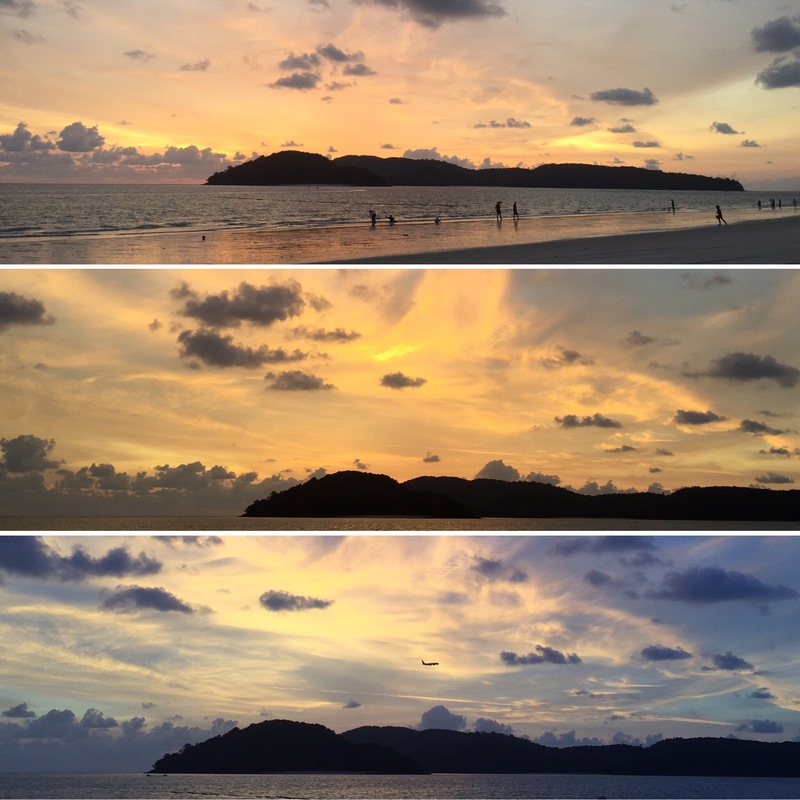 We spent the last two days on Langkawi by the beach. 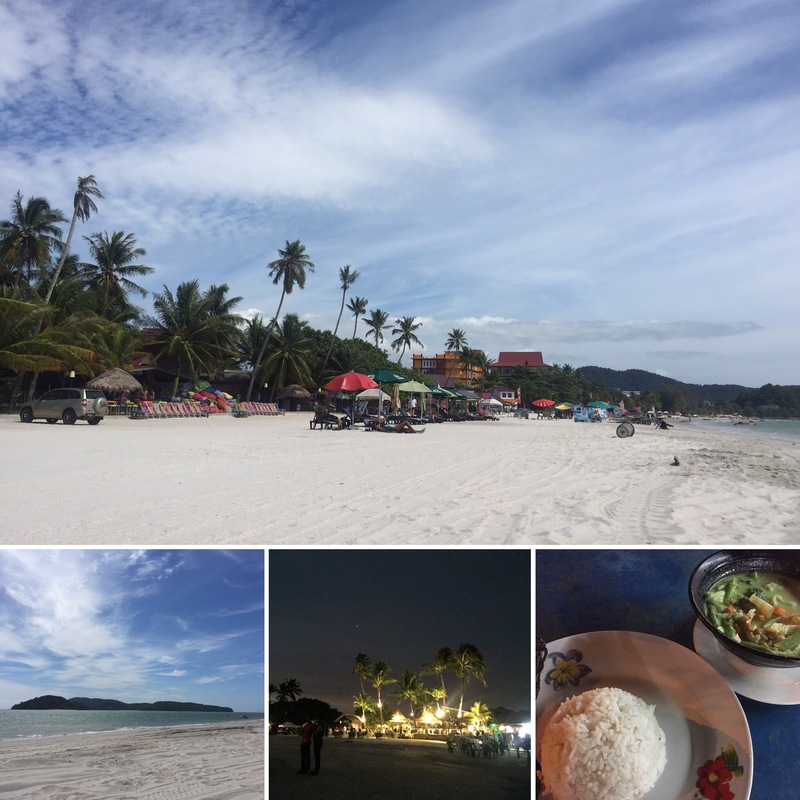 We changed to a hostel called Gecko Guesthouse which was across the road from the main beach in and area called Pantai Cenang. The beach wasn’t the best one we had ever been to or were likely to go to but it was still nice and we had a good couple of days relaxing and getting a tan. There were also a lot of really good food stalls around this area of town so we ate well in the evenings for really cheap. One night we bought some beers – super cheap as it’s duty free on the island (45p) for a little can!) – and sat on the beach to watch the sunset. It was an amazing sunset with the sky looking like it was on fire it was that bright red! 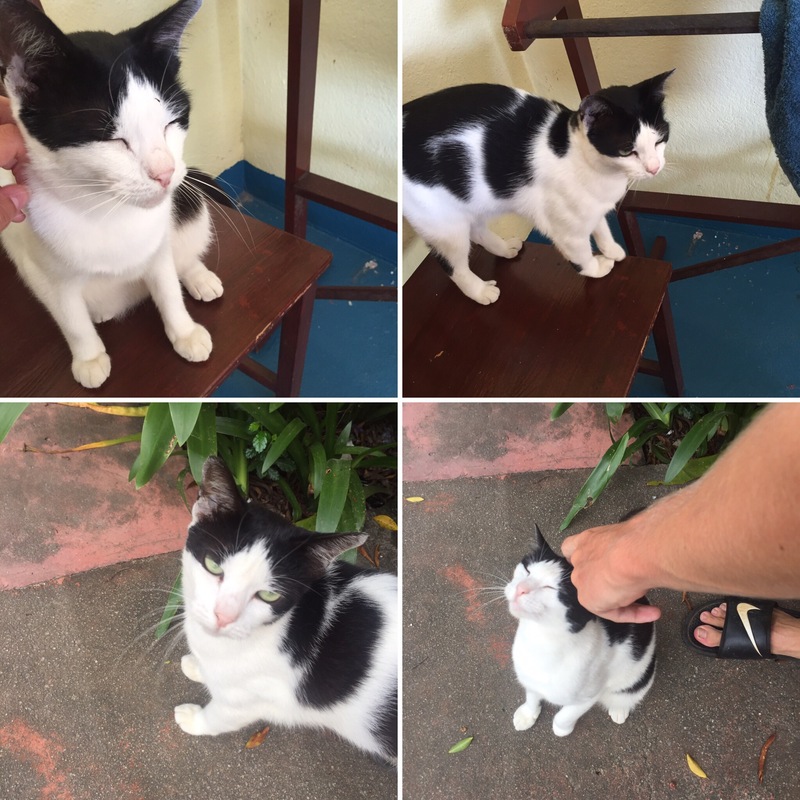 There are also ﻿loads of cats on the island and there was one cat at the hostel who seemed to decide to adopt us during our stay there. He would persistently try and come into our room and would make sure it was in reach of you for a stroke when it could. We both really like cats so this wasn’t an issue for us. 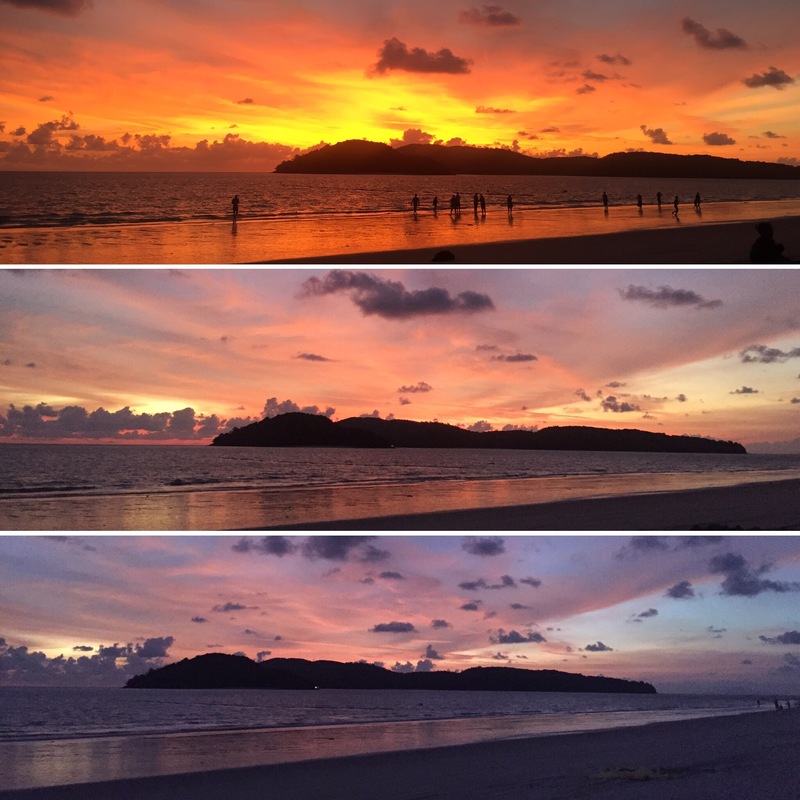 Langkawi Island was a great place to spend a few days and, looking back, we could have given ourselves a couple more beach days here. There is a lot to do and you can see why it gets nicknamed a resort island. 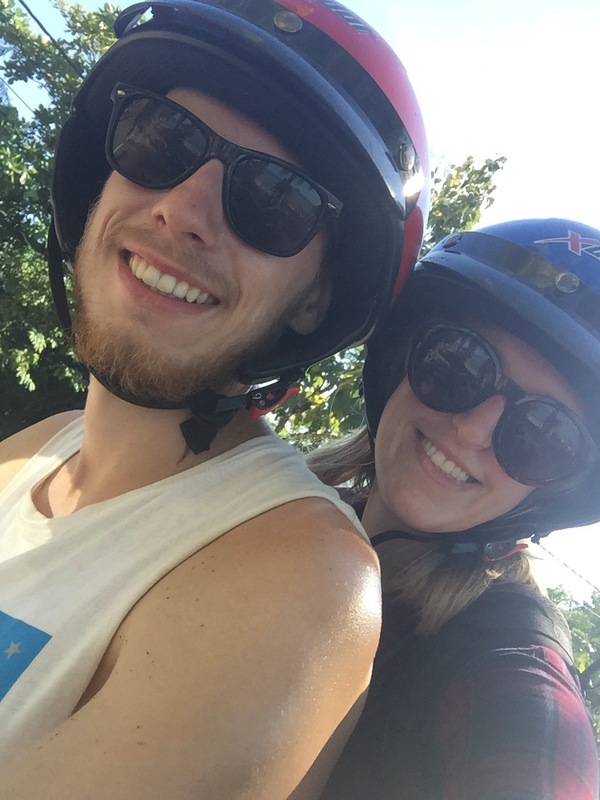 We didn’t do it but there was the option to go banana boating, parasailing and jet skiing as well as there being island hopping tours on offer! 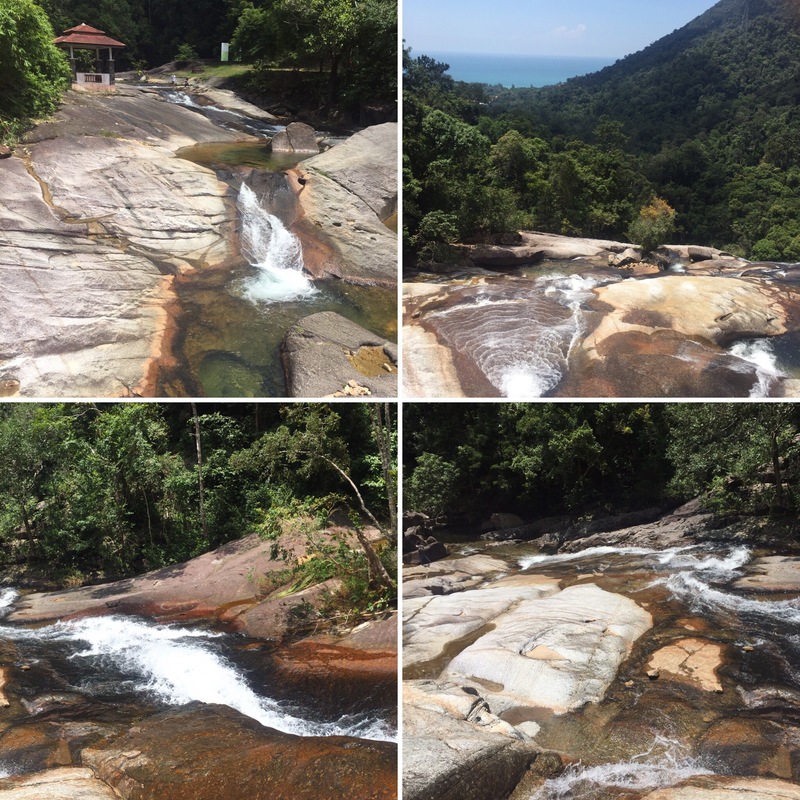 You would be able to stay busy for days and days here and I think it’s a must for anyone’s trip to Malaysia. Looks like a really fun trip, I love when there isn’t a lot of people at the beach! That sunset is absolutely stunning too!